The Android Runtime (ART) which Google introduced for testing purposes with its release of KitKat last year has now fully replaced the Dalvik virtual machine in the Android Open Source Project (AOSP) code. This means you should expect the next version of Android (which could get official as soon as next week) to come with ART and only ART – Dalvik is essentially dead from this point on. The change has been spotted in two commits made recently to the AOSP code. 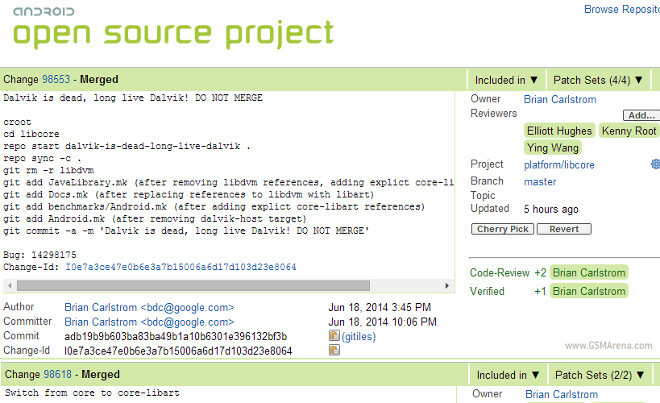 One of those removes Dalvik from master branch, while the other switches the default runtime compiler to ART. So what’s the big deal, you ask? Well, in short: Dalvik uses a Just-In-Time compiler, while ART has an Ahead-Of-Time compiler. That means ART pre-compiles bytecode when an app is installed, while Dalvik does the same thing only when an app is started. The use of ART should thus result in faster app start times, as well as better performance overall – though whether these improvements will be noticeable to end-users remains to be seen. For what it’s worth, Google says it can cut app start-up times in half with ART, and who wouldn’t want that? Possible downsides to ART include apps taking up 10-20% more space in your device’s storage, and longer app installation times.